Baseball Prospectus was kind enough to put out their top prospect lists in some order other than worst record to best, so we don’t have to wait 2 months to see the Nats list. You can see it here, and the list itself isn’t behind the paywall (although all the write-ups are) so I’ll start with that. I won’t spend time on Gioltio – they love him on BP and this writeup is no different. If the only site like this you really pay attention to is BP, then you’re probably pretty darn confident he’s a future superstar. They basically say Cole is ready to come up. I was a little surprised about that, but I guess it makes sense, he’s already spent time in AAA and pitched well enough. He doesn’t look like a top tier guy to them, just a solid middle-of-the-rotation guy. It will be interesting to see where he sits on the swing man depth chart next year. We all know Michael Taylor by now, he played with the Nats last season and looked pretty good out in CF. He’s probably also ready to play – and the story hasn’t changed on him in 3 or 4 years – probably going to have a low batting average, probably going to strike out alot, and a very good chance to hit a bunch of home runs and steal a bunch of bases. Nothing here makes me think any different than when people were comparing him to Mike Cameron back in 2010. Reynaldo Lopez did not exist before this summer when he suddenly showed up on the stats sheet with 40 or so consecutive scoreless innings. I heard about him around then, and did a pretty extensive write-up on him that you should definitely check out. They say “the overall raw stuff and potential here is very legit.” He’s still got some time in the minors, and he seems to need some serious refinement, despite what he did to some low level competition this year. It will be very interesting to see what he does beyond low-A ball this year. He needs to play in 2015 for us to see if he will do that stuff. I get the feeling he’ll get some amount of time, but it’s a crowded outfield bench, and he may not even start the season in the majors. Jakson Reetz was someone who I’d never even heard of, but I love the bad science fiction character spelling of his name. He was drafted last year in the third round, and he’s really young. Throw in the fact that he’s a catcher and you have someone who is many years away from the big leagues. But, if he does fulfill his potential, he could be a good hitting catcher with some pop. The hitting is the stronger tool right now, he “creates solid extension through point of contact; squares up ball with backspin; ability to hit gap-to-gap; plus-to-better raw power; 20-plus home run potential down the line,” but his catching skills need work. That being said, he’s athletic, and pretty new to catching, and should improve greatly as he gets more time behind the plate. Wilmer Difo caught my eye here just because of the position – it could be a position of need for the Nats soon. He’s won’t be in the majors that quickly, though, BP lists his ETA as 2017. Difo sort of came out of nowhere in 2014, hitting .315/.360/.470 in low-A Hagerstown after not really approaching these numbers since the 2011 Dominican Summer League. He a switch hitting speed and contact guy that showed some good power, not necessarily home run power, but that type that keeps a middle infielder from hitting nothing but singles. After one year of success, it’s hard to think he’ll be much more than a good utility player, but another season like 2014 could change some minds. The Nats strength plays all the way down through their system – pitching. They look set for quite a while with starting pitching, even if everyone doesn’t pan out, the top of that list is ready or near-ready, and pretty well-regarded. They also have some outfield depth that has already shown up in the majors. It gives them some flexibility if they decide to make moves or trades, but also allows them to let one or two guys walk away after finishing their contracts. It’s not a spectacular system, but it’s still good, although the abundance of really young players who will eventually fall off the list as they don’t produce is a little troubling. They have plenty of pitching for the foreseeable future, and they have some ready-today outfield help that could really work out well. Beyond that (and let’s be honest, having tons of good pitching is no small thing), the system is less impressive, and you wonder if any trades they make would focus on finding some infielders. Giolito, Cole, Lopez and Fedde are the next wave of pitchers looking to join the likes of Strasburg, Jordan Zimmermann, Gio Gonzalez and company. All have differing abilities and arsenals, but each acts as an asset for the club moving forward. 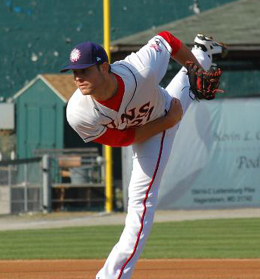 Giolito is a pleasure to watch, and baseball will rejoice when he takes the field for his major league debut. Cole is close to the bigs, and we will likely see him in some capacity heading into next season. Lopez and Fedde are still far from the majors, but both have underlying talent that could cement their status on this list for quite a few years moving forward.